The Sensation of Sight » Blog Archive » Part 13, Post production continues in L.A.
Part 13, Post production continues in L.A.
As Aaron and Mario were ensconced in their house in the woods editing, we also began making arrangements for moving our entire operation to Los Angeles where further finishing work on the film would commence once we had a “locked picture” in hand. The reason for planning this move from one coast to the other was because, after much research and investigation and receiving quotes for the work that needed to be done, we realized we could finish the post work on the film less expensively in Los Angeles than anywhere on the East Coast. The sheer volume of post production work in L.A. actually made for lower quotes and therefore a favorable cost scenario for us even with having to cover flights and most meals. We were fortunate to find places to stay with friends as the production bank account was dwindling. While we were early in the editing process in New Hampshire, we were also extremely fortunate to be able to hire a wonderful post production supervisor in L.A. , Geoff Garrett. Geoff was invaluable in helping us set up in advance the involved process that the digital version of the locked picture would go through out there for an additional two and a half months before we had a finished film. By the second week of February, after much tweaking and fine-tuning, we were satisfied we had a locked picture and were ready to make our move. So we shipped all our elements to L.A. , and Aaron and Mario flew out for the duration of the work there. I joined them when there were steps they needed me to see and hear, especially for the final mix of all the various components of sound and music with the picture. Briefly, the next steps we had to go through with the film with the help of Geoff included transferring the entire film to a much higher quality digital master, designing all the sound effects, color correcting the film scene by scene so it had the visual tone, mood, and consistency that Aaron wanted, and re-recording dialogue scenes that had unavoidable unwanted background noise that we couldn’t eliminate in the sound lab (like a scene in a town park next to the water when the flooded river was roaring into the microphones but we wanted desperately to use one of the stone benches there–that sort of thing). Then the final steps were mixing all sound and music in with the finished picture on a high-tech sound stage and finally making a digital master of this finished version and dubbing dozens of DVD screener copies from this master for use in promoting the film. In addition to working on the actual picture and sound, we also were negotiating contracts for all the pre-recorded music and songs we’d selected to use in the film. This in itself is a tedious and involved process and requires the services of a professional music supervisor. Again we were fortunate, through Geoff, to connect with Mason Cooper, who as an experienced music supervisor spent weeks contacting every music publisher, recording company, and artist for each song we wanted to use. As it turned out, there were only two songs out of sixteen that we had to replace because they weren’t available or we couldn’t negotiate a workable deal, and we were told that was far below the usual number of songs that have to be replaced in an independent feature. So by the beginning of May we had in our hands The Sensation of Sight as a finished film on DVD. We hadn’t transferred it back to 35mm yet, but we had all elements available to do so. The final transfer back to 35mm would wait until we needed it for a film festival or after we had landed a distribution deal so the distributor could pay for it (or so we thought). So with our DVD screeners we were ready to begin the next phase of the process–the launch of the film into the world. Spending a few months of winter/spring in L.A. instead of New Hampshire sounds like a good plan! Of course as investors we’re also glad it was the most cost effective way to get the job done. Gerard–I’ll take New Hampshire anytime (but then, ask me again at the end of January…I might reconsider). And as far as getting things done well for as little $$ as possible–that’s sort of the mantra of indie filmmaking. And I’m not just saying that because you’re an investor in the film! 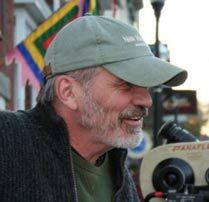 I think smaller, more rural states like NH, ME, VT, etc are better to produce films because I believe the communities would become more involved. Sometimes businesses like catering will give a production a deal. If people reached out to more small communities with film productions they’d be surprised what they’d get. When I was looking at doing my sequel, possibly in Maine, I had looked at the former AFB for part of my post-apocalyptic city landscape. I talked with the people in charge and if I went into production I could shoot in most of the base for almost free. They just wanted film production there that much. I think there are a lot more options out there with the idea of working alongside small communities to produce a film that people realize.